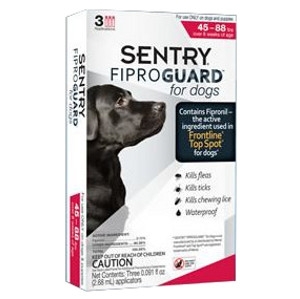 Using the same active ingredient, fipronil, and at the same concentration as Frontline® Top Spot®, FiproGuard topical treatment provides your dog with rapid protection against adult pests. It costs less and is available at convenient retail locations. For 45-88 lbs. Protects your dog and your family against the diseases fleas and ticks spread, including Lyme disease. For use on puppies and dogs 8 weeks of age and older.